Back when computers were coal-powered, showing more information to site visitors meant shuffling them off to a new page. We were sad. In time, the modal window was introduced, and those of us who built websites considered it our savior: it permitted the presentation of relevant, contextual content or transactions in the same screen. We were happy. Over time, however, we abused our savior: we began stuffing entire pages of content or multi-step forms into that poor little floating box. (And don't even get me started on ad modals that appear the moment you land on a new screen.) All of this misuse and abuse of the humble modal has left many calling for its demise. But the modal still serves its original, invaluable purpose of presenting snippets of content or simple transactions in a focused area without forcing a context shift. 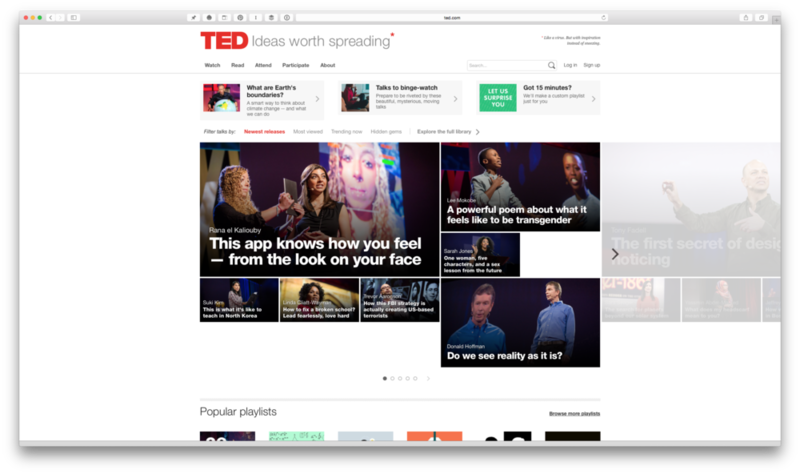 On TED, for example, we implemented a modal that lets users do things like save talks to watch later without having to be redirected to a login screen first. Use a modal when a trip to a new screen might be overly disruptive. Include no more than a few lines of content or a very abbreviated form. Avoid spawning a new modal from an existing modal. Allow users to close the modal multiple ways — e.g, the esc key or clicking outside the modal — not just a close button. Fix the modal's position so it can't scroll off-screen. Make sure it works well on mobile, or design an alternative. Never spawn a modal automatically (unless you'd like a midnight visit from Jakob Nielsen). If a modal isn't right, but shifting screens is less than ideal, there are alternatives including slides, accordions, expanding panes, and enhanced tooltips. These are all great ways to add depth while keeping people anchored in the current experience, but none is a universal replacement for the humble modal.